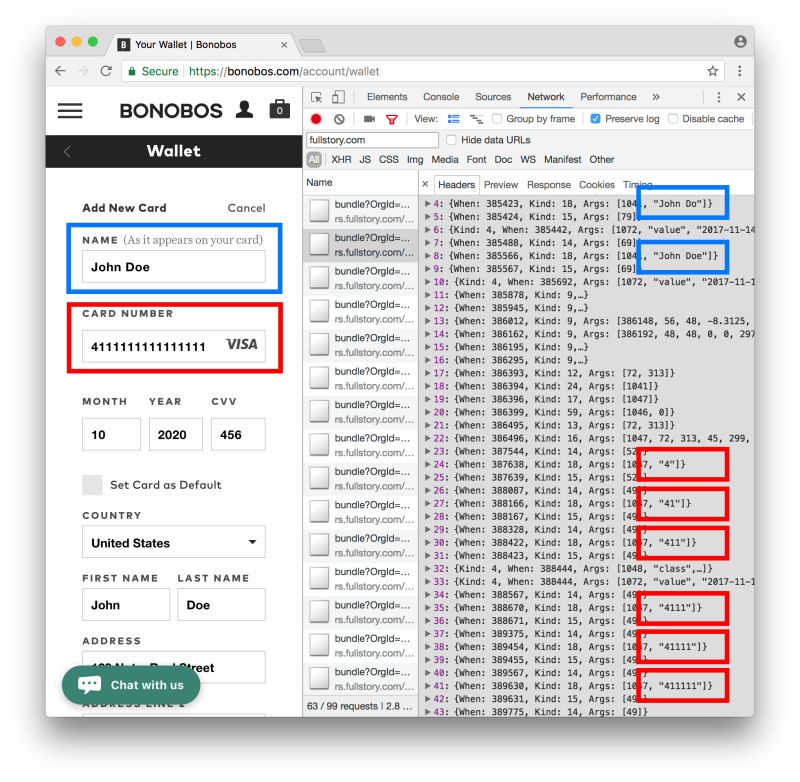 The account page of the clothing store Bonobos leaks full credit card details to FullStory. The screenshot of Chrome’s network inspector shows the leaked data being sent letter-by-letter as it is typed. The user’s full credit card number, expiration, CVV number, name, and billing address are leaked on this page. Email address and gift card numbers are among the other types of data leaked on Bonobos site. The above image shows a prescription request for the anti-depressant drug, Zoloft. During the process of creating the request, the name of the prescribed drug is leaked to FullStory . Manual redaction was used to exclude the user’s name, their doctor’s name, and the quantity of medicine from the recording (marked in the image by a striped overlay). However, the user’s full name was leaked earlier in the process (not shown in this image), which allows anyone with access to the recording to associate this prescription with the user’s real identity. 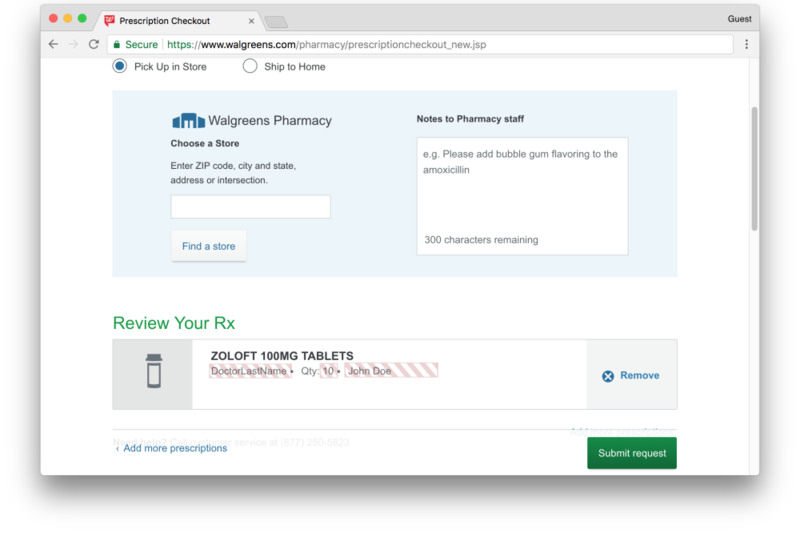 Walgreens allows users to enter their “Health History”, which can include other prescriptions and health conditions that may be relevant to prescription requests. During this process, most of the user’s personal and health information are excluded from FullStory’s recording through manual redaction. However, the process leaks the selected medicine and health conditions, the latter of which is shown above. 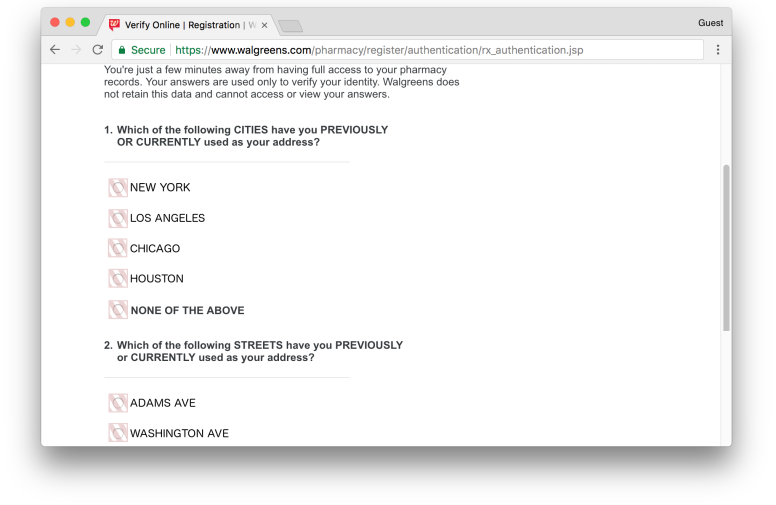 During account signup, Walgreens requires a user to verify their identity by asking a standard set of identity verification questions. The selection options for these questions, which may reveal the user’s personal information, are displayed on the page and are transferred to FullStory. Additionally, the mouse tracking feature of FullStory will likely reveal the user’s selection, even though the radio button selection is redacted. 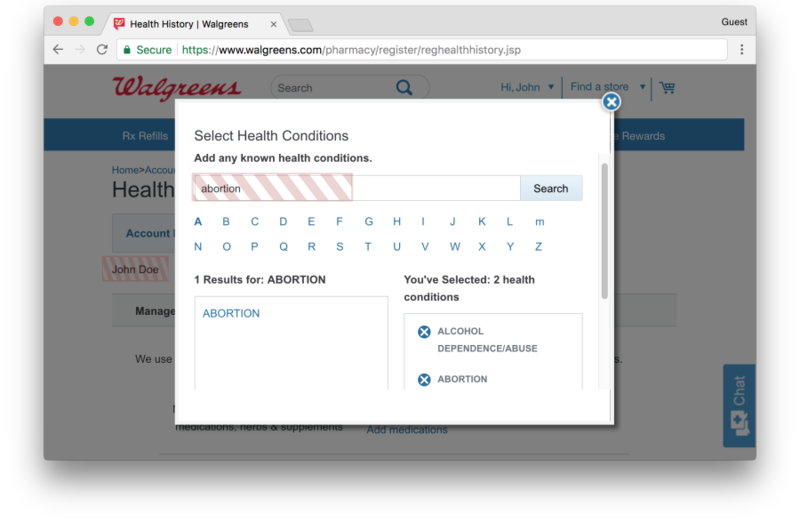 The inclusion of this data in recordings directly contradicts the statement at the top of the page: “Walgreens does not retain this data and cannot access or view your answers”. We use the term ‘exfiltrate’ in this series to refer to the third-party data collection that we study. The term ‘leakage’ is sometimes used, but we eschew it, because it suggests an accidental collection resulting from a bug. Rather, our research suggests that while not necessarily malicious, the collection of sensitive personal data by the third parties that we study is inherent in their operation and is well known to most if not all of these entities. Further, there is an element of furtiveness; these data flows are not public knowledge and neither publishers nor third parties are transparent about them. 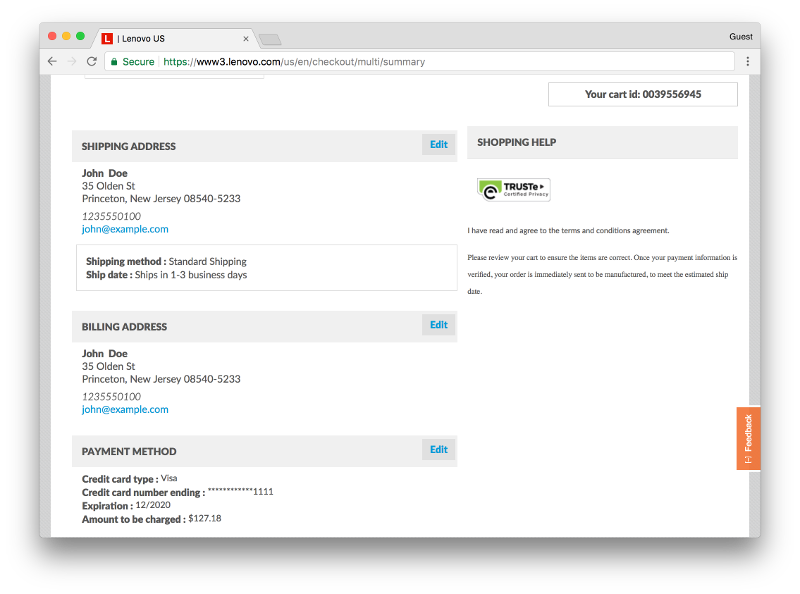 On the final page of Lenovo’s checkout procedure, the user’s billing, shipping, and payment information is included in the text of the page. This information is thus included in the page source collected by FullStory as part of the recording process. Definitely want to look into this more. But since you’ve done that already, can a consumer block this? You probably already know this, but ForeSee does this too. If you ever get one of those “Thanks for visiting” popups on a web store that asks you if you want to take a survey, there’s a good chance that your entire session has been recorded. Choosing to take the survey is considered “consent” for that recording to be retained, even though it’s not mentioned anywhere in the popup. The data is sent to their servers in compressed binary form (zlib? ), so it’s not as obvious as with some frameworks. Thanks for the suggestion! Our methods should be able to catch exfiltration even if the data is compressed, but for the present study we only tested the seven most popular providers and ForeSee wasn’t one of them. Thoughts on Quantum Metric? They seem to be a new startup in the space. 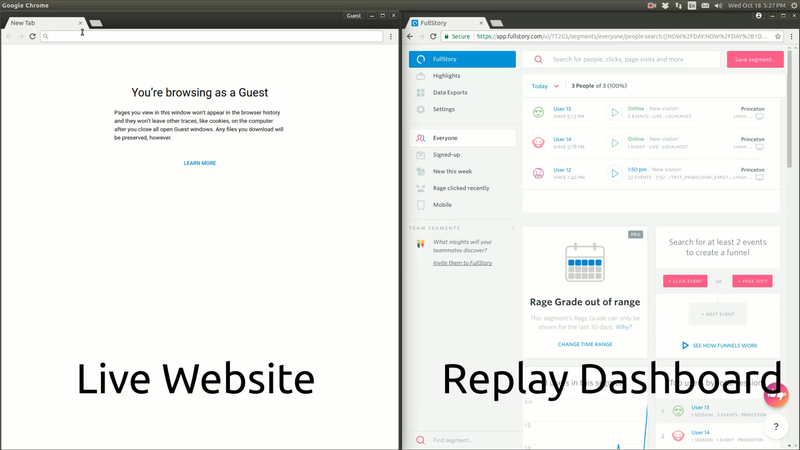 We detected Quantum Metric’s session replay scripts. You can them summarized here: https://webtransparency.cs.princeton.edu/no_boundaries/session_replay_sites.html. What do I do to block all of these? I do my own DNS blocking and would consider writing code to process data passing through a machine. Related: What is a good way to identify sites and pages guilty of this? Yet, unfortunately, you continue to use the word “leak” or “leaked” several times throughout the article. Please replace all occurrences with “exfiltrate” — as used at the beginning of the article — in order to accurate reflect the true nature of what is happening here. The data is not leaking. It really is being exfiltrated and sent to third-parties. Using “leaked” minimizes this and makes it appear less severe or serious. Yes, we agree. We’ll be more careful with the terminology in future posts in this series. Is there a published paper that goes with this that has additional detail of the process and findings? If so please add a link for where others may download and view it. Especially if your research is publicly funded this would seem a reasonable request. Thank you for considering. Your opening line suggests there may only be a series of articles, in trickle feed format that may or may not share all your results; I will watch for those but wanted to ask the above anyway. Thanks for helping others understand the extent of their exposure on the web. We are publishing this study as a series of blog posts in which we reveal our findings, and then plan to compile them into a paper where we will go into detail on our methods and innovations. Thanks for your patience. So, why aren’t these companies being prosecuted for sharing passwords? Isn’t that a violation of Federal Data Protection laws?? So, all my passwords, which the company stores only the hash so it can’t be stolen, are openly stored at some 3rd company tracking DB. That’s well known problem in EU. We are funded by an NSF grant (CNS 1526353). For a portion of this work I was funded by a fellowship from Princeton University. Some of our measurements were funded by an Amazon AWS Cloud Credits for Research grant. Can you provide a list of all known session replay companies and root domain names? I’d like to block all of them through a browser add-on since I can’t opt-out. The following URL patterns are used to detect script embeddings for the site list that we published . Do you happen to have a list of all of the hostnames that serve the scripts? E.g. mc.yandex.ru as opposed to just yandex.ru? I use my machine’s /etc/hosts file to block a lot of stuff, unfortunately you can’t block entire domains, just individual hosts. The list we shared  contains specific subdomains where possible. You can get the hostnames by removing the path from the URLs (e.g. mc.yandex.ru/metrika/watch.js -> mc.yandex.ru). Have you come across IBM Tealeaf, it’s a session replay tool I’ve used in the past but I am wondering why it’s not in your list? I believe it was one of the first and the biggest supplier… I’d love to hear about them or are you not allowed to mention a large industry player like IBM?? Thanks for your question. The list of scripts included in the blog post or data release should not be considered comprehensive. There are a number of technical reasons why a script may fail to be included: obfuscated data flows (i.e. data flows in a format we don’t support), page collection size limits, or user sampling. Likewise, our methodology detects page source collection by third parties regardless of the intention, meaning we also discovered a number of non-session-replay scripts using page source for other purposes. IBM’s Tealeaf service was detected during our measurement. It, and a number of other parties, will be further analyzed in our upcoming paper. What about the possible leakage of data from one tab to another. So say you are on a work web site an type in a password while you have a tab open to Wallgreens. Waht are the chances that that data is also being captured? This is not possible. A recording script will only be able to record within the tab it’s embedded. By design that may be, but could someone with malicious intent modify a script to watch other tabs? The browser prevents scripts from being able to do this. A malicious extension could do cross-tab monitoring, but that’s out of the scope of what we examined. 1 – Thanks for watching the big brother(s) who is/are watching us. 2 – “Speak Your Mind,” you ask. I read all above and … my mind is frozen – I am speechless. I was aware of collecting my personal data but not to such extent. You put a lot of effort into your report. Thank you! Unfortunately, you do not show any details about how the monitoring is being conducted. Your method of selecting web sites is biased. And details like “200KB” look dilettantish (that should read either “200 kB” or “200 KiB”). What is the best way for your simple computer user to prevent this? Ghostery has been mentioned above. Would no script do the same? NoScript configured to block all scripts would do the same, since the recording scripts will not run. A blocker which includes the EasyPrivacy blocklist, like uBlock Origin, will also block most of the parties mentioned in this post. I find it interesting to see that there are so many “news makers” who are monitoring their readers. Anybody worried by such things can install Ghostery or equivalent. No experience of others but Yandex Metrica is an excellent analytics tool which gives website owners ability to not record personal data. And I am sure a lot of people who read this will do exactly that. Nevertheless, this service is obviously morally flawed. You can see it by the fact that websites stopped using it after this study. Even the people who spy, not only those who are spied on, feel that it is wrong to do this. If these applications trasfer credit card data together with CVV in plaintext, its time to inform the big credit card companies like Mastercard and Visa about the implementations on big websides. I think they will stop this spook faster as you think, on both sides, the websides and the companies of this “spyware”. For example the retention of the cvv is illegal for payment service providers, these f.c.ers send it in clear text over the internet. The fix for this isnt people dealing with this by loading and using specific software to block this sort of behaviour. Blocks functions used for psychological profiling and tracking by ad networks. Companys have started profiling user behaviour, like scrolling or moving the mouse, NoProfile blocks this. amnesty.org is the Amnesty International website. Surely this is an error. Why would an organisation that defends privacy use software to gather detailed information about persons visiting its site? For the site your reference we only find evidence that a hotjar script is loaded on the page (hence the “analytics script exists tag”). We did not find evidence of session recording. For more information, check out the description at the top of the data release page. Interesting people mention Ghostery when their parent company, Evidon, sells your data to advertisers. It also contains two trackers owned by Google and Yahoo (see https://reports.exodus-privacy.eu.org/reports/178/). I stopped using it for that reason. When Ghostery is set up, the user is asked if she is willing to share usage and crash data with Ghostery. It is an opt-in process. The two trackers you mention are used to capture the usage and crash data. I haven’t looked at the Ghostery code to see when those trackers are used, but I would assume that if the user opts not to share their data with Ghostery, they are probably not used . . .
You mentioned fidelity.com and Walgreen.com in the above report, but I can’t find those in the zipped CSV file for the full list of the released data. Have they stopped doing that since your reporting? Thanks for reporting this issue! Due to a technical error, we incorrectly excluded some sites while generating the output list, which included fidelity.com and walgreens.com. We’ve corrected the bug and posted the updated list. 1. Perhaps browsers could hide passwords from (third-party) scripts. This would involve hiding the contents of password fields and also censoring KeyboardEvents when the password field has focus. 2. Maybe Content-Security-Policy could be made finer-grained to prevent unwanted exfiltration. For example, being able to restrict which parts of the dom a third-party script has access to might help. Do these make sense? Are there other browser mitigations you would propose? Thanks Arthur! I like your suggestions, and would love to see browsers implement mitigations. So without a way to differentiate first and third party within a single context, it might be possible to restrict all scripts from being able to access an element (something like the `writeonly` attribute proposed in: https://mikewest.github.io/credentialmanagement/writeonly/). This might break some sites which handle passwords in an unexpected way. As a first step, I think it might be helpful to simply provide a more visible indicator to interested users (and developers) of what’s happening on a page that contains sensitive inputs. For example, display script URLs in a Ghostery-style notification for scripts which do things like register event listeners for keypresses and mouse movements on the top elements, or register blur or change handlers on password inputs. The URL displayed (first vs third party) might be imperfect for the reasons described above, but that information can still be helpful in making it easier to audit a page. I was contracted to develop this type of activity tracking / session reproduction back in 2010, so far from being a new thing this has been going on for quite a long time. I can’t (or won’t) say who I did it for, as it’s pretty irrelevant. One thing I did put in when I coded it (though it would have been trivial for someone to remove) was to disable the keyboard tracking when a password field was active – though obviously that wouldn’t have helped if someone accidentally typed their password when not in the correct field. Thank you for the informative article and all the work behind it.